Remove threads from celery stalk and cut into pieces. Cut salmon fillet into pieces and liquidise with the celery. Place crumbled rusks in a bowl and mix with an egg. Roll them into small balls and then flatten them. Heat up oil in a non-stick frying pan and fry the balls on both sides. Keep warm. Cut leek into rings, rinse and allow to drain in a sieve. Melt butter in a frying pan and stir fry the leek rings. Add stock and allow to cook for 15 minutes on a low heat. Liquidise the mixture and sieve if necessary. Return to pan. Add beer, mustard and cream and allow to cook for 3 to 4 minutes. Season with salt and pepper to taste. 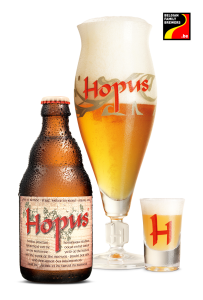 Place fish cakes and sauce on preheated plates accompanied by a nice cold glass of Hopus beer.